The careful market research and customer profiling preceding the design and build partnerships have culminated in an exceptional luxury motor yacht that will redefine the genre. The 82-foot design envelope benefits from executive jet planning which has enabled De Birs to virtually 'shoehorn in' an interior worthy of a superyacht. The raised pilothouse bridge, forward salon, separate dining area for eight, large covered aft deck and expansive upper deck set this yacht well above its peers for sheer size and volume. Built on a cost effective Freezone Park, De Birs yachts use a truly international management team, the very best tried and tested materials and equipment. 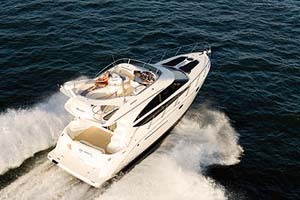 Powered MTU engines the 82 RPH LX cruises effortlessly at 24 knots and tops 26. All in style with an interior certainly fit for a superyacht. The De Birs 82 RPH LX is competitively priced. The main salon, richly appointed in fine veneers, leather and quality furnishing in silk and cotton is an oasis of air-conditioned comfort. Aft of the comfortable lounge area with the entertainment centre and large plasma screen is the separate dining table and bar. Throughout, the plinths for tables and the bar are stylishly designed and finished in veneers resplendent with custom made fixed glass tops. 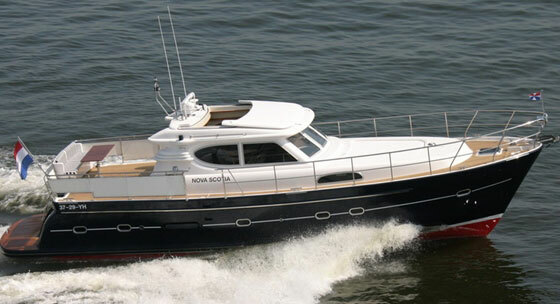 The forward area has an independent lounge/office with access to the upper enclosed raised pilothouse and day head. The whole area, being on one level, gives pleasant sightlines and perfectly combines the feeling of space with comfort and luxury. Details such as cutlery and crockery stowage add the finished touches to this fine interior. An aft stairwell down to the lower deck leads to the galley, engine room, crew quarters and utility room. A staircase in the forward lounge area opens below into a curved corridor and the richly appointed cabins. Amidships is the full width master suite with television, desk/vanity, lounge area, walk-in closet and luxury power shower. Moving forward, two identical twin bedded guest cabins also have large bathrooms with power showers and glass doors emblazoned with the De Birs emblem. The forward VIP suite is surprisingly large due to the ample width of the bow section and only slightly smaller than the master. Again resplendent with a power shower, pull-out television, and desk/vanity, the VIP Suite certainly lives up to its name. The whole accommodation deck is completely finished in fine matched veneers, beveled edged mirrors and fine silks and fabrics giving a light and airy ambience and a volume only found on much larger yachts.